Speaking from the lefty’s point of view, the most important tactic is to get off to a quick start. The lack of awareness from your opponent is an advantage you should be taking advantage of. Eventually, righties will make the necessary adjustment to get back in the match. Hopefully by that time, you have a comfortable lead. Lefties hit the same spin a righty does. The difference is the side of the ball they hit from. For example, a righty’s slice serve is struck on the right side of the ball and bounces left to right of the returner. A lefty’s slice serve is hit on the left side of the ball and bounces right to left of the returner. A practical serving tactic is for the lefty server to jam the returners’ forehand on the deuce side and take them out of the court on the ad side. This is an easy way to create a weak return or open up the court to take control of the point. For groundstrokes, a lefty forehand will tend to jump right to left of the opponent and left to right on the backhand side. There are usually some cheap points to win off of those shots since the righty may not be prepared for the awkward bounce. On the deuce side, work on serving out wide and up the service T. Now, when you are warming up your serve during your match warm up, serve to your strength. Do not show them you can hit the other spots. Once the match begins, after a few points, start mixing up location, like a dominant pitcher does in a baseball game. Once your opponent has made their adjustments, mixing up location becomes more important to keep them off balance and guessing. Do you like your backhand? What I have noticed, as a fellow lefty and a teaching pro over the years, is that we tend to favor our backhand over the forehand. How many lefties do you know, if they swing a bat or golf club, swing from the right-hand side? This is more common than you think. Ask a lefty, because if that’s the case, their backhand should be stronger, since that is their backhand side. That should be the first test in the warm up, check to see if the lefty is running around their forehand to hit a backhand. The cross-court lefty forehand is a natural shot and it is important to take advantage of your opponent’s backhand side. 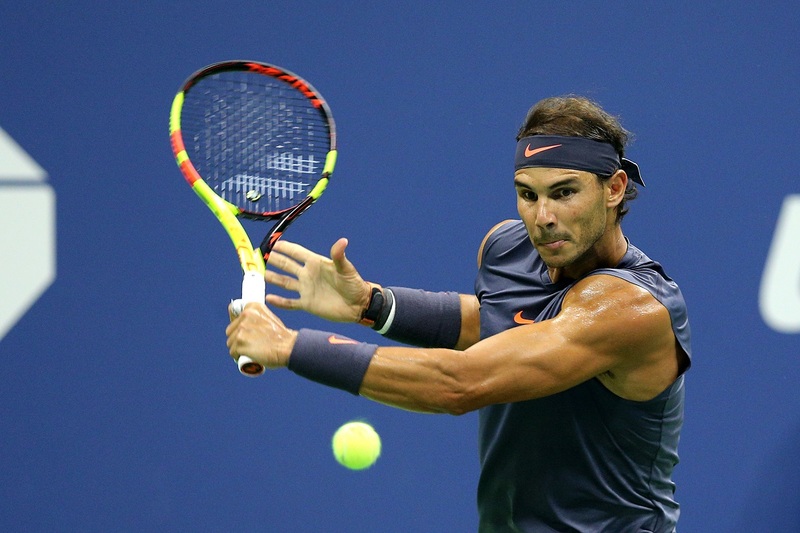 When you watch Rafael Nadal, you cannot help but notice how much topspin he uses. A strategy that works well for him against Roger Federer is he hits a high looping topspin forehand cross-court to Roger’s backhand. The ball jumps up quickly out of Federer’s comfort zone. This creates either a weak shot for Rafa to move in and take control of, or Roger tries to go for a shot that’s not there and makes an unforced error. Challenge them on their serve by favoring their stronger targets. Meaning, take their lefty serve away from them and make them show you they can hit the out wide serve on the deuce side and up the T on the ad side. Once they show you they can, get into a more neutral returning position. As a server, try to serve more to the lefty serving targets. Serve up the T on the deuce side and out wide on the ad side. Remember, earlier I mentioned lefties generally prefer their backhands. If you can catch them off guard and serve to their forehands, you might be able to get an easy hold. They are expecting you to serve to their backhand. Now you can stay on pace and go for the break on their serve. If a lefty and righty are playing together in doubles, I feel the lefty should play the deuce side. This gives the doubles combo overheads and forehands in the middle of the court. To hit to a lefty’s backhand, the ball must be hit down the line or hard cross-court. These are tougher shots than down the middle and may create unforced errors. But subconsciously, forced. These are just a few things to think about from the lefty’s and the righty’s perspective. Of course, every individual is different and really what you want to do during a warm-up and match is to see where your opponent might be comfortable and uncomfortable. But most importantly, notice which hand they are swinging their racket is before it’s too late. Michael Smookler is the General Manager and Tennis Director at Centercourt of Florham Park. He brings more than 30 years of experience teaching and directing tennis. He is currently the Eastern USPTA Vice President and an Elite Certified Teaching Professional. Additionally, Coach Smookler is a Freelance Writer for NorthEast Tennis Magazine and coaches the Governor Livingston Boys Tennis Team, where he earned the 2018 Eastern USPTA High School Coach of the Year.